Useful for following up on the overall status of shifts for a period, the shift allocation report will display ‘normal’ shifts which are allocated successfully, empty shifts that may need filling, or shifts that are pending some form of action, such as a swap, give or drop. 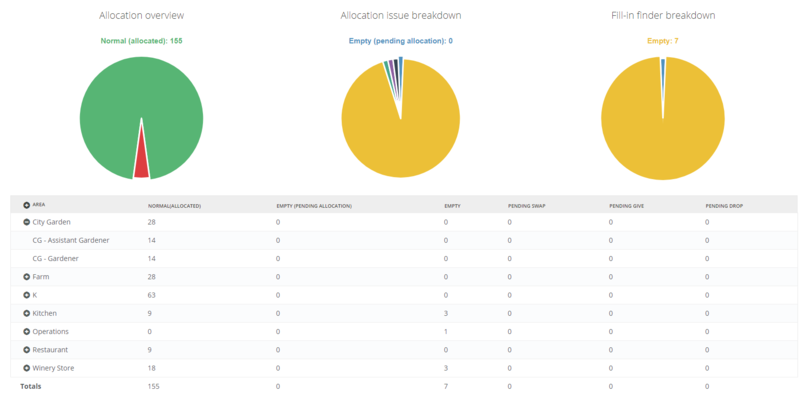 ‘Empty (Pending allocation)’ shifts are also visible, which are shifts that have been offered via the Fill-in finder and are pending a final allocation. Filter using the fields at the top of the report to find the data you wish to review, then use the export button to save the table data as required.